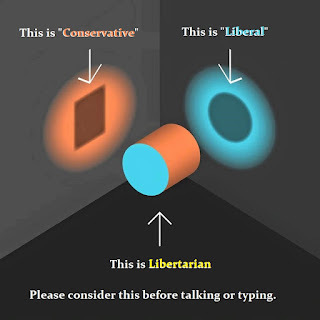 Political idealism tests/quizzes show libertarians are socially liberal and politically conservative to the extreme, and probably because humanity's frame of reference is a framework for serfdom instead of social organization. Freedom and liberty are reality, and not extreme, ..except from a slave's perspective. As for the graphic with the round hole and square hole I would have to change the peg into a triangle shape or some such before i'd accept it since i reject the idea that libertarianism fits into either one of those categories.